The name of the Russian capital is obvious and familiar, so that few people with non-historical education, reflect on the origin of the word. Especially often this question can be heard from children during the onset of the eternal "why?" or guests. 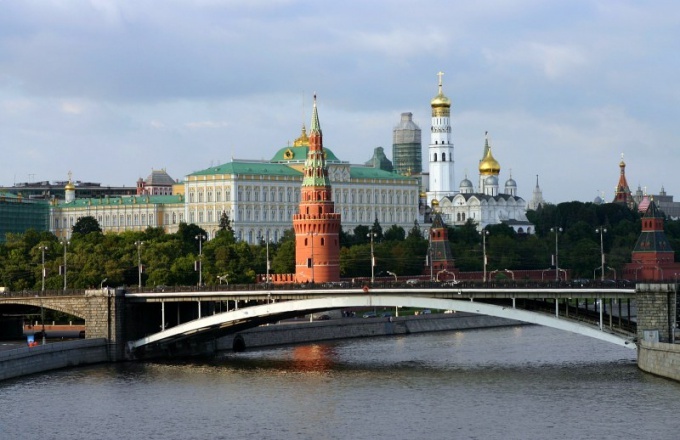 The most popular versions of the origin of the word "Moscow"
Among the most popular are two options that support the historians studying the city itself, the question of its origin and the place of Moscow in Russian history. The first version comes from the two root "Mosk" (stone) and "cov" (to hide). It is believed that originally the phrase "stone shelter" or "stone fortification" was called the small fortress and the river flowing nearby. This conjecture exists, and its variation, defending the original naming it the river of Moscow. According to historians, this word has a Finnish origin, according to which the name is built from two roots – "mosquito" (a cow or bear) and "WA" (water). That is the name of the river and the Russian capital means "cow" or "bear water". The second version dates back to the Finno-Ugric tribes, who called Moscow moorland or territory. But here there are differences, as historians believe that this sense came from the lexicon of the Slavs. But both groups of scientists agree on one thing – the capital really is quite a swampy area that is an indirect confirmation of the hypothesis. Their version of push and theologians of Orthodoxy. Thus, the biblical figure Meshech (the grandson of Noah who built the ark) settled in the area coinciding with the location of the present capital, with his wife named KVA. Thus, allegedly formed the name of Moscow. Their children were a boy and I a girl of the University, the names of which owes its name to the river Yauza, which flows in the capital and suburbs. Known and version of the word "mosquito", who calls the river flowing through which people reached out to several small and large bridges, or bridges. After the name was passed to the next standing settlement. This version supports the well-known authoritative source of Ivan Zabelin. There is a hypothesis of naming Moscow "beautiful places" representatives of the Erzya tribes, for whom "many" meant "beautiful", and "Kuva" - a place, area, or district. A combination of "mass Kuva" subsequently transformed "maskva", and the last in Moscow. Another, perhaps the most unlikely version is that the name Moscow was given by the tribes of the Kama region, Komi and others. In their vocabulary the word "all" always meant "water", so often all these words and belong to the hydronyms of the people of Prikamye. Nevertheless, this hypothesis is less likely fans, because the objective of the remoteness of Komi Republic from the Russian capital.